I have always been fascinated by historical watersheds, by how the events of a single decade or a single year turned out to be the pivot on which the destiny of the world took a decisive, often irreversible turn and changed the course of human history. Most people with even a passing interest in history will be able to single out at least one key year or decade in which, in their view, everything changed decisively. While for some, that year could be 1939, when the Second World War began, others might mention 1947, when a new India was born – and so on. In my own reflections on global history, I have arrived at a list – revisable, of course – of some 20 such “watershed” years and decades, which, in my view, had a far-reaching impact on all later history. For the sake of this article, I have decided to choose one of them for a somewhat detailed analysis: the year 70 AD and the events which it witnessed in Palestine, which, then as now, was a region imbued with tremendous geopolitical significance. My focus will be specifically on those events which led to the breaking away of Christianity from its parent religion, Judaism, and the way Judaism re-invented itself in response to the very same events. A close observation of the two religions will reveal that Judaism can be understood without any reference whatsoever to Christianity, but it is impossible to understand Christianity without reference to Judaism. In fact, until the year 70, Christianity, in the place of its origin, Palestine, was no more than a sect within Judaism and it was only after that year that it began its evolution into a separate religion. For the greater part of subsequent history, Christianity was sadly on a collision course with its parent faith. It will be interesting to see how all this unfolded across time. Let us begin with the status of Judaism in the decades leading up to our watershed year. Even as far back as that, Judaism was a religion that claimed the adherence of a few million people of West Asian ethnicity who called themselves Jews, a considerable number of whom lived in what was known as “the Diaspora”, outside their Palestinian homeland. Judaism distinguished itself from the other religions of the ancient world by its firm commitment to monotheism and to the rejection of any attempt to represent the “one and only God” in the form of idols or pictures. On more than one occasion, this brought the Jews into conflict with the succession of foreign rulers of Palestine beginning with the Assyrians in the 7th Century BC and ending with the Romans, who were the colonial masters at the time under discussion here. Most of these successive powers – the Assyrians, Babylonians, Greeks and the Romans – were (with the exception of the Persians, who had briefly succeeded the Babylonians) followers of polytheistic religions with a strong element of idol-worship. At the dawn of the 1st Century AD, the core beliefs and practices of Judaism had been in existence for at least 600 years. The first emergence of the religion into the light of secular history is roughly in the fifth century BC, when a significant number of Jews were released from captivity in Babylon by the new Persian emperor, Cyrus, who permitted them to re-build the Temple in Jerusalem, which had been destroyed by the invading Babylonians a century before. The Jerusalem Temple, the only shrine dedicated to their God, Yahweh, was believed to have been built by the legendary King Solomon in the 8th Century B.C. After its restoration by the liberated captives, this “Second Temple” continued to be the centre of Jewish worship right up to AD 70. Under the rule of Herod the Great, in around 20 B.C, it had even been expanded and renovated. The Jews saw themselves as a people with whom Yahweh, their God, had entered into a covenant. This covenant bound them to uncompromising obedience to a code of beliefs and observances that Yahweh had revealed to them through the prophet Moses in the distant past. According to the covenant, Yahweh had promised to prosper their national life and protect them from foreign rule as long as they obeyed his commandments, known collectively as his Torah. But barring the golden age under David and Solomon from the fabled past, (when Judah was part of the once united nation of Israel), it was the fate of the Jewish nation for most of history to be a pawn in the games the big empires played with each other. Far from blaming Yahweh for letting them down, the Jews attributed their sociopolitical catastrophes to their own failure to honour their part of the covenant with Yahweh. A long line of prophets – Isaiah, Ezekiel, Jeremiah and Amos, among others – who claimed to speak on Yahweh’s behalf, reinforced this belief by scolding them for their unfaithfulness and appealing to them to return to Yahweh and seek his forgiveness. They assured them of Yahweh’s commitment to restore them to greatness if they re-affirmed their loyalty and obedience to him. From 516 BC to 70 AD the Temple in Jerusalem was at the centre of Jewish life. A large group of priests, whose offices were hereditarily passed on, officiated over an elaborate system of ritual animal sacrifices as prescribed by the Torah. They were under the headship of the High Priest, who alone was permitted to enter the innermost sanctum once a year to plead with the God Yahweh to forgive the sins of the entire nation. 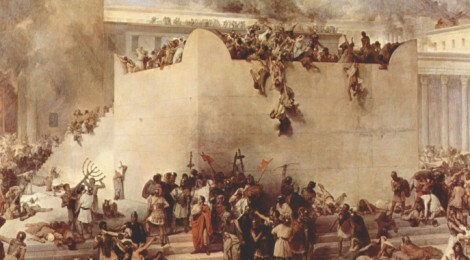 The Temple was a beehive of activity especially during the great festivals of Pesach and Yom Kippur, ( Passover and Atonement) with surging crowds of worshipers, supplicants and pilgrims from all over Palestine and the far-flung lands of the Jewish Diaspora converging there to seek Yahweh’s blessing. While for a long time the Temple was the only pillar of Jewish religious life, historical and cultural factors soon led to the emergence of another pillar, the synagogue. The synagogue was an institution that evolved in the context of the great dispersion of Jews across the whole of West Asia and North Africa that came to be known as the Diaspora. Not long after Palestine’s incorporation into the Greek empire, large numbers of Jewish emigrants were living in cities as far apart as Alexandria in Egypt and Damascus in Syria. These Jewish communities in the Diaspora soon began to feel the need for a more immediate religious life than the meager once –a- year visits to Jerusalem that distance had restricted them to. By gathering together in a hall every Sabbath, hearing the sacred Torah read out and expounded by learned rabbis, and by congregationally reciting their psalms and prayers, Jewish communities established the second great institution of Judaism – the synagogue. By 132 BC, the entire Jewish scriptures (the Torah, the Prophets, and the Writings) had been translated into Greek, because by then there were large communities of Jews in the Diaspora who had lost all contact with the Hebrew language of their ancestors and knew only Greek. This Greek translation, famously known as the Septuagint, was, much later, to have a great shaping influence on the texts that were to be collected together to form the New Testament of the Christians. Despite the common core of beliefs and observances that united the Jews of the time, both at home and abroad, the Judaism of the First Century AD was far from homogeneous. Differing responses to the political situation caused by direct or indirect foreign rule under a succession of powers down the centuries led to the formation of fairly divergent schools of thought. Most of these had their origin in the early years of Greek rule a couple of centuries earlier. The increasing influence of Greek ideas and cultural patterns on the Jewish population led to new doctrines during that era. The essentially Platonic ideas of the immortality of the soul and of an afterlife now became integrated into Jewish theology for at least one group of Jews, later to be called the Pharisees. The priestly aristocracy rejected these as foreign borrowings unsupported by the Torah. This group came to be known as the Sadducees. One Greek ruler named Antiochus Epiphanes thoroughly humiliated the Jewish people by desecrating the Temple and burning a pig as an offering to the Greek god Zeus in the inner sanctum, the holiest shrine of Judaism. Many Jews were martyred for daring to resist his depredations. This dark period spawned a wave of writings that came to be known as apocalyptic literature, full of coded symbols and metaphors pointing to the end of the world and prophesying the coming of a powerful personality named the Messiah, who would be born into the ancient King David’s royal lineage and be used by Yahweh to drive out the oppressors and re-establish an independent Israel. As it turned out, someone nearly fitting that description did appear and was successful in overthrowing Antiochus. His name was Judas Maccabeus and the independent Jewish kingdom he established lasted for a hundred years – until 63 B.C. Then the Romans took over and Palestine once again came under foreign rule. Once again, the longing for the Messiah sprouted in Jewish hearts and many Jewish sects were imbued with this messianic expectation. They struggled on in eager expectancy of the great liberator, the Messiah, who they believed would be born among them and be used by God as an instrument to drive out the hated Romans, re-establish Israel’s lost greatness and usher in God’s just rule over the whole world. The years dragged on, however, and the yoke of Roman rule only became heavier but the Messiah was nowhere in sight. The Romans, for their part, were aware of the subversive potential of all messianic movements and were always alert to the possibility of frenzied Jewish mobs declaring some rabbi or other to be their Messiah, particularly during the Passover festival when crowds of Jewish pilgrims from home and abroad thronged Jerusalem. They always believed it prudent to nip such popular aspirations in the bud. Many messiah claimants appeared briefly in the limelight every once in a while, but movements around them were brutally put down by Roman administrators in Jerusalem whenever they cropped up. It is within this contextual frame that we must view the life of one of the most influential personalities in all of history: Jesus of Nazareth. It is one of the great ironies of history that for all the tremendous influence he has cast over the centuries, there is virtually no account of him by contemporary historians or biographers who assess his life from a neutral observer’s point-of-view. A handful of such accounts do indeed appear from approximately five decades after his death, but these are rarely more than a few paragraphs in much larger works of history, such as those by Josephus and Tacitus – merely passing references. This leaves the secular historian with little choice but to attempt to infer the details of Jesus’ life from sources written decades afterwards by those who chose to see him as an incarnation of God (Yahweh), indeed, as God’s “only begotten son.” These sources are what we today know as the Gospels and the epistles of the apostles of Jesus. Since they were written with propagandistic intent, the professional historian cannot but be skeptical about their neutrality and objectivity. Nevertheless, scholars over the past three centuries have been able to mine both the canonical and the apocryphal gospels in their attempt to re-construct the historical life of a man named Yeshua of Nazareth (Jesus’ original name in Aramaic) as distinct from the Christ persona that was later ascribed to him when Christianity became an independent religion and he came to be worshipped as God incarnate. As the canonical gospels themselves attest, Jesus was a practicing Jew. The gospels mention his circumcision as a child, his frequent visits to the Temple and to synagogues and his affirmation of the eternal validity of the Torah that Yahweh had revealed through Moses. He attracted disciples to himself as an itinerant rabbi by attempting to shift the emphasis from a joyless ritualism, based on a literalistic interpretation of the sacred texts, to a celebratory universalism based on the Messianic variant of Judaism and its spirit of expectancy of the imminent arrival of God’s just rule, God’s “kingdom”, which would replace the prevailing corrupt world order. It is very likely that he eventually saw himself as the one authorized by God to initiate a series of events that would hasten the end of the prevailing world order and usher in the glorious kingdom of God, a kingdom that would be characterized by radical compassion and universal justice. On what turned out to be his last visit to Jerusalem during the Passover season (of, most likely, the year 30 A.D), his disciples and a significantly large crowd of followers from his home province of Galilee, began boldly raising slogans in public, hailing him as the Messiah. Not surprisingly, the Roman authorities quickly had him executed by crucifixion to prevent further political instability. For his followers, who had believed that God would miraculously intervene to decisively end Roman rule the moment Jesus was apprehended, this was a terrible disappointment. The gospels record that most of the disciples were in hiding when Jesus was being crucified.